Would you like to get up close and personal with some NSW locals? There’s nothing better than meeting sharks in their local natural habitats and in NSW, nothing safer. 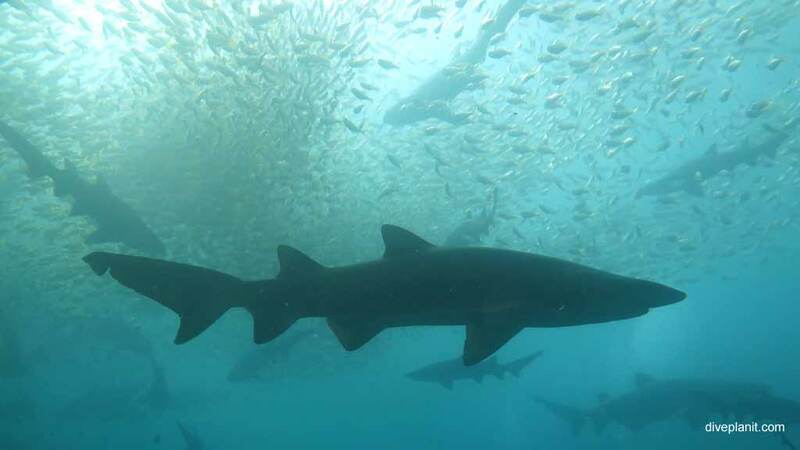 Our local shark is the grey nurse (Carcharias taurus) which grows to about 3 metres and though it looks fierce there are no reported incidents of grey nurse sharks harming divers – or humans for that matter. Better still, the grey nurse often aggregate in numbers from a handful to a few hundred, in well known sites, usually around small islands not too far from shore. Also, during the day, they swim very slowly, in depths even accessible to divers with only their first level of certification. This makes them easy to observe, and photograph and they look great in any diver’s log book, or Facebook page. 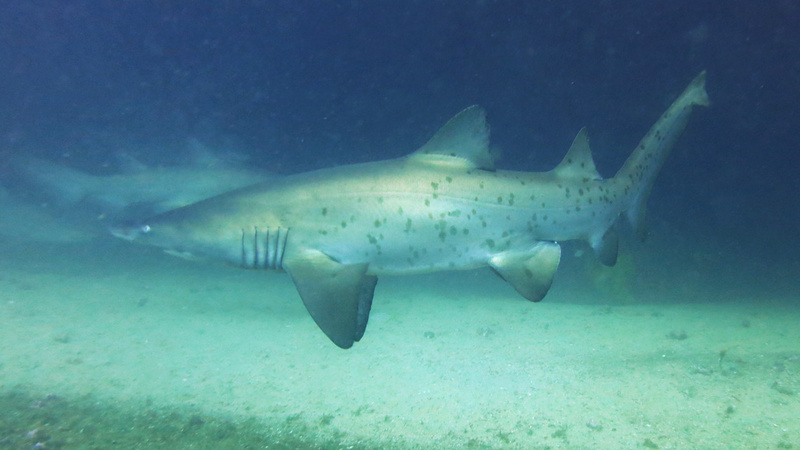 Here’s our lowdown on the most popular sites to see grey nurse sharks in NSW. Do not block their movement – ensure you are not in the direction that they are obviously going. To get the best of your time with sharks, try to stay in one spot for a while, level with the shark (i.e., at the same depth), and control your buoyancy and breathing. They don’t like lots of bubbles. 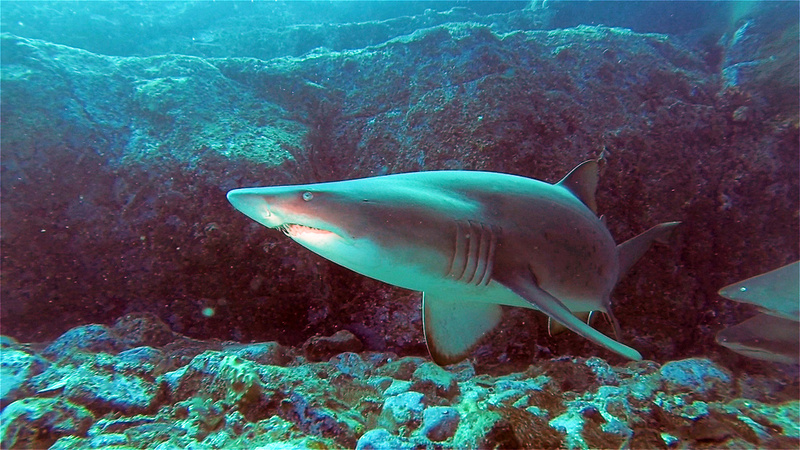 Here are some sites best known for their grey nurse sharks. Magic Point is the only known site around Sydney where Grey Nurse Sharks regularly aggregate, though in quite small numbers. The site is off the headland south of Maroubra Bay and is really only accessible via boat. 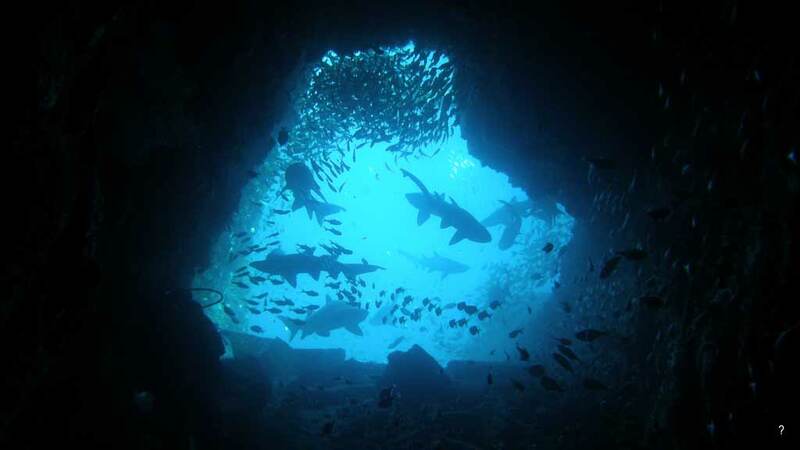 The sharks aggregate around two small caves about 5 metres high at the 20 metre mark. The sharks are not always there, and can often be outnumbered by the divers who want to see them. You might see Port Jackson and Wobbegongs at the same site. Many of the Sydney operators include Magic Point on their weekly itinerary. Go with a small group of more experienced divers if you can. Dive Centre Manly offer a Shark Awareness Course combined with a double boat dive to Magic Point. Broughton Island is a small island and collection of rocks north east of the entrance to Port Stephens. 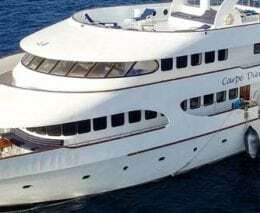 Accessible only by boat, it is about 50 minutes from Nelson Bay Marina. There are a number of excellent dive sites, and two in particular are noted for shark encounters. Probably the best known, and one that leaves the biggest impression is Looking Glass – a crack that runs right through one of the smaller islands and features a natural shark aquarium with amazing atmospheric lighting from the vertical shafts of light. The other is North Rock, which has a site enclosed by large rocks and walls, which also forms a natural aquarium with many vantage points to sit quietly and watch these magnificent creatures cruise slowly passed. 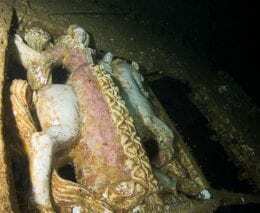 Even without the grey nurse, these are still impressive dive sites. Seal Rocks almost certainly has the largest aggregations of grey nurse sharks in NSW – quite probably because it is the least accessible. There are four different sites around Seal Rocks varying in depth from 10 to 40+ metres. It’s one of those places where you need to have a bit of experience under your weight belt and ideally some recent deep dive experience. The absolute best time to see grey nurse sharks is around June, so start thinking about a trip now. 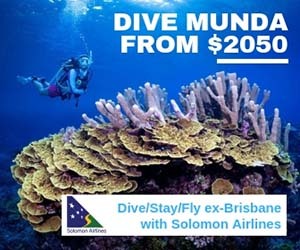 Seal Rocks is dived mainly out of Forster, so have a look at the local operators’ websites then just pick up the phone. A more accessible site just off Forster beach is Bait Grounds where you can sometimes find grey nurse sharks (particularly early in the morning) in just 9m of water. It’s about 150m off the beach, so it’s even possible to do as a shore dive. Another well-known dive in NSW, more famous for the cave than grey nurse sharks, but one I’ve never dived without encountering sharks. Often the first dive is through the cave from the lower rear entrance. Coming out into the Aquarium, early morning divers will be treated to the sight of a dozen or so grey nurse milling around. Later in the day, the grey nurse will be found ‘around the back’ at the end of Colorado Run. You’ll also see Wobbegong, rays and numbfish; even the occasional hammerhead has been sighted. Fish Rock is only accessible via boat. Fish Rock Cave is rated on of Australia’s Top 10 Dive Sites – sharks or no sharks. The South Solitary Islands is another uninhabited collection of small islands and rocks, in this case, north east of Coffs Harbour, about 40 minutes in a dive boat. It has a dive site appropriately named ‘Grey Nurse Gutters’. 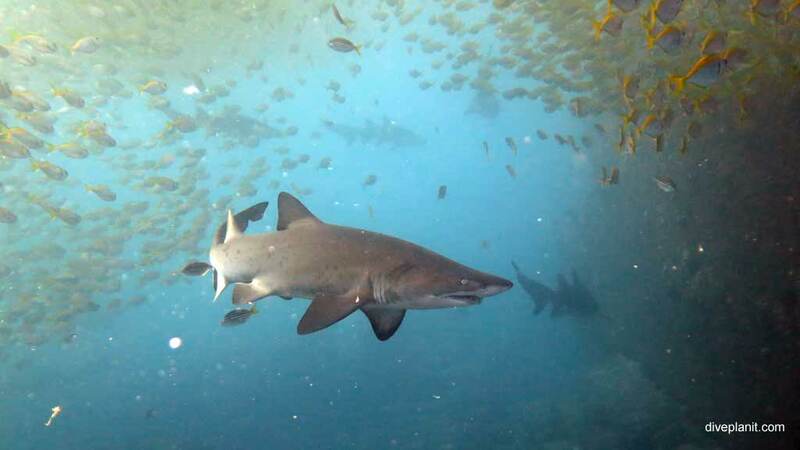 With a bottom around 18m and usually pretty good visibility, it is another special place to see grey nurse sharks. 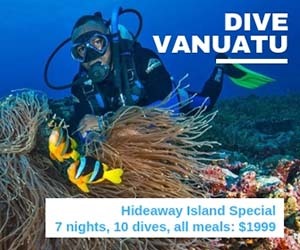 Like the other sites mentioned here, if they don’t happen to be around the day you visit, or weather does not permit you to get to the northern end, there are a dozen other interesting dive sites that will make the trip to the South Solitaries more than worthwhile. We are fortunate in NSW to have a number of options to see sharks in their natural environment. It appears that the best places to see them are the least accessible for humans. There is probably a good reason for this: we have been systematically slaughtering them for most of the last century and only now have we realised their value – not just that they are critical to maintaining healthy oceans, but also within eco-tourism. So apart from supporting our environmentally aware dive operators and visiting these sites in their safe hands, what can you do to ensure grey nurse are around for the next generation to see? You could take the Shark Awareness Speciality course, which will give you a greater understanding of why sharks are in peril, managing threats to their existence, and further ideas for taking personal action. 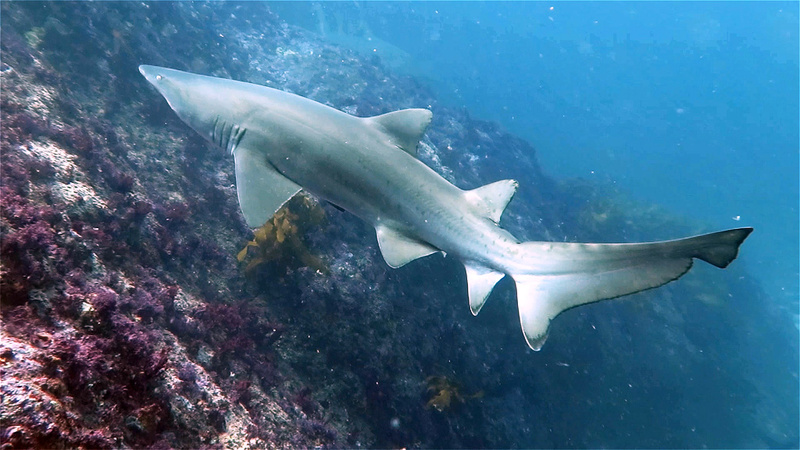 You could contribute your photos to citizen science based organisations like Perth-based Shark Base. 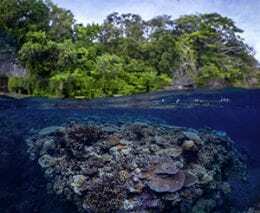 Join local campaigns to support local Marine Protected Areas, or join the Australian Marine Conservation Society, the only society dedicated exclusively to protecting Australia’s ocean wildlife and their homes. Or simply google “no shark cull” and follow your nose. 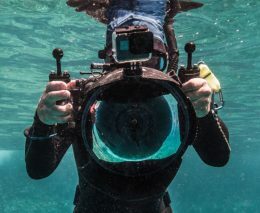 Photo Credits include: Jetty Dive, Coffs Harbour; Fish Rock Dive, South West Rocks; Goodviz Photography. 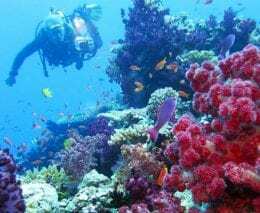 This entry was posted in Diving and tagged Fish Rock, Fish Rock Dive Centre, Shark, South Solitaries, South West Rocks, NSW, Magic Point, Broughton Island, Looking Glass, Dive Centre Manly, South Solitary Islands, shark diving. Bookmark the permalink.